As her readers will recognize, Alafair’s strong psychic abilities are a integral part of the story, and in a delightful almost off hand style, Casey reveals that Alafair’s youngest daughter Grace, still a toddler, shares her mother’s psychic insights. Casey is at her best in character descriptions, with Alafair – the mother of twelve – a believable and sympathetic character, and her twenty-two-year-old daughter Martha, representative of a new and very different generation of woman. iloveamysterynewsletter.com, January, February, 2009 reviews. 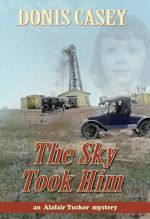 Special thanks to guest reviewer Betty of The Betz Review for contributing her review of The Sky Took Him. Review Copyright Â© 2009 â€” Hidden Staircase Mystery Books â€” All Rights Reserved. www.mysteriousreviews.com Oct. 10, 2009.